Ballaleshwar Vinayak Temple or Ballaleshwar Pali Temple is one of the eight Ashtavinayak Temples in Maharashtra dedicated to Lord Ganesha, located in village Pali which is in Sudhagad taluka of Raigad district, Maharashtra. Ballaleshwar Vinayak Temple is situated between Sarasgad Fort and the river Amba. Among the Ashtavinayakas, Ballaleshwar is the only Ganesh who is named after his devotee. The Ballaleshwar Pali Ashta Vinayak temple is 110 km from Pune via Lonavala and Khopoli, and 124 km away from Mumbai. The Ballaleshwar Temple at Pali has two sanctums. In the outer sanctum is the idol of the mouse which faces the deity, holding a modak in his paws. 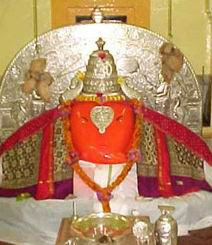 The idol of Ballaleshwar is 3 feet high and faces east, with its trunk turned towards the left. The navel and eyes of the idol are decked with precious stones. This is one of the rare statues of Lord Ganesh who appeared as a Brahmin and he is shown wearing clothes as Brahmins do. The statues of Siddhi and Buddhi are seen on both sides of the Ballaleshwar Vinayak. The original Ballaleshwar Vinayak temple was made of wood and later renovated with stone. The tomb is designed with eight lotus petals. The walls are made of stones with liquefied lead. Facing East direction, the temple is shaped like the letter Shree in the Devnagiri script. The two lakes nearby add beauty to the temple. Water from the right side of the lake is used for Lord Ganesh's worship and other special occasions. The temple is constructed in such a way that the rays of the sun would fall directly on the deity. The Ballaleshwar Ashta Vinayak Temple opens daily at 5.00 am and closes at 11.30 pm. Please note that the outer sanctum of the temple closes at 10.30 pm. On Chaturthi days, the timing of pooja is between 6.00 am to 9.00 am and on these days, the Ganesha idol is offered panchamrut snanam (bath), Royal dress, Naivadya, Aarti, Palakhi and mantrapushpam in the evening. Lord Ganesh here is named after his ardent devotee, Ballal. Legend has it that Ballal was the son of a rich businessman who did not like his son’s devotion to the Lord. Ballal spent most of his time worshipping and also influenced his friends for the same. One day, his father was in search of his son and found him in the forest, worshipping Lord Ganesh. He disturbed the puja and threw away the idol of Ganesh. After beating his son, he tied him to a tree. He then left Ballal in the forest stating that let Lord Ganesh himself come and rescue him. Ballal kept calling upon Lord Ganesh who took the form of a Brahmin and appeared before him. He rescued Ballal and asked him to make a wish. Ballal pleaded the Lord to reside in the Pali village. The God accepted his request and resided in a stone which is now believed to be the idol of Ballaleshwar. The idol that was thrown away by his father is known as Dhundi Vinayak and the temple is facing west. Devotees first visit this temple before going to the main temple. Bhadrapadi Utsav and Maghi Utsav are the two main festivals celebrated at Ballaleshwar Temple of Pali. On the day of Vinayak Chaturthi, the entire temple area is decorated with colorful lighting. The idol of Vinayaka is taken in procession around the village and the devotees are blessed with ‘Prasad’ after the procession is over. Maha Naivadya is another important festival which attracts a large number of devotees. The Dhundi Vinayak festival is celebrated from Jestha Shuddha Pratipada to Panchami (5 days). The rituals of Shri Ballaleshwar on Bhadrapad Chaturthi and Panchami Day are performed for Dhundi Vinayak Utsav including Purana Pravachan, Bhajan Kirtan, birth highlights and Maha naivadya. Pali is about 30 km from Karjat and 124 km from Mumbai. From Mumbai, Pali can be reached via Panvel and Khopoli. From Pune, Pali is 110 km via Lonavala and Khopoli. Pali Bus Station, run by the Maharashtra State Road Transport Corporation (MSRTC), operates regular bus services connecting Pali to other major towns and cities including Mumbai, Pune, Khopoli, Karjat, Panvel, and Khopoli. Some direct bus services are available to Pune and Mumbai. Pen Railway Station, on the Panvel-Roha railway line managed by the Konkan Railways, is the nearest railway station to reach Pali. Kasu Railway Station (14 km), Hamarpur Railway Station (4 km) and Karjat Railway Station (30 km south-west) are other railway stations near Pen Railway Station.